Small claims court is supposed to be simple and economical (and it is when compared with civil court). However, small claims court is not as basic and affordable as it could be when you know what you’re doing. A benefit of the small claims court is that you do not need a lawyer as lawyers cannot represent anyone in small claims court. It costs less to start a lawsuit, the procedure is structured, and your time in front of a judge or commissioner is normally very short (though you might wait some time before seeing one). To start a small claims case, you pay the court a nominal fee, then pay to have the debtor served. There’s no need to dress up in small claims court and the forms are simple to complete. In many cases, you can just fill out the forms on your computer and bring them with you. There are also drawbacks to making use of a small claims court, including a limitation on performing pre-trial legal actions such as discovery. There are limits on when you can take legal action and how much you can ask for. A small claims judge may just come up with monetary amounts and in some cases, require that assets be returned to you. Likewise, if your small claims case is appealed by the debtor, they can usually have a legal representative represent them in the appeals court. If the amount the debtor owes is less than $300,you may as well just chalk it up as a loss. It costs money to apply a judgment and the expenses are not always recoverable. If the amount the debtor owes is less than the cash restriction of the small claims court, then by all means use small claims court. If the quantity the debtor owes is less than twice the money restriction of the small claims court, you should definitely consider using small claims court because civil court is far more expensive, and if you need an attorney, that costs a lot more. 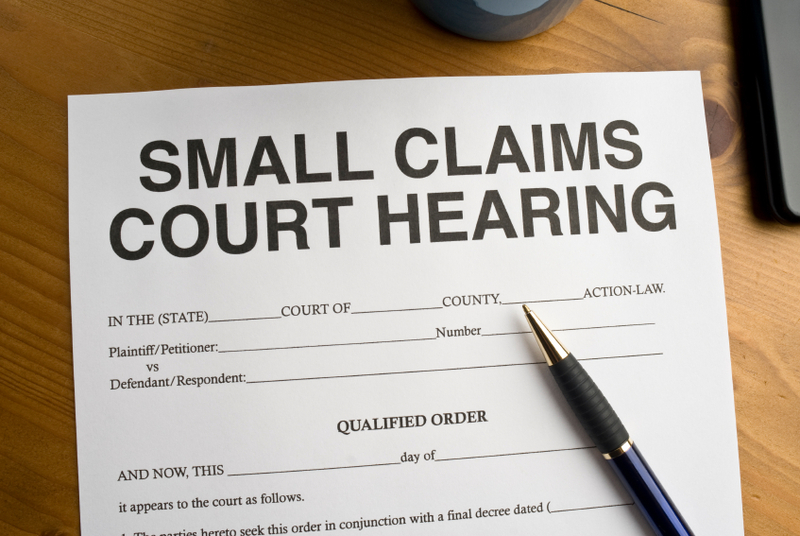 In some cases, you may not be able to use small claims court. Foreclosures and circumstances where the amount the debtor owes a great deal of money are not allowable in small claims and must instead be heard in civil court. Find out exactly who you are suing before you sue them. Do they use other names or addresses? Obviously, gaining your judgment is just the beginning of attempting to collect your money. Contact the debtor by mail with a formal letter. Be courteous and offer to work with the person on a payment plan or possibly a settlement. Settling could make good sense as it saves you the costs, irritation, and delays of enforcement. Do not make any threats or harass the debtor in any way. If you have time and perseverance, you could try to implement the judgment yourself. Your court’s website and other resources will provide you with ideas. Keep in mind it will cost money for every action, even if the step does not end up getting you closer to obtaining your money. To avoid the expenditure and inconvenience, hire a judgment enforcer to recover your judgment. If you want to recover it yourself, the best tools are discovery and garnishment or levy. To discover the debtor’s assets, you could pay the court and a process server to serve paperwork to get the debtor to appear in court and bring the files you request. Sometimes public records such as past bankruptcies, property records and tax records can give you clues. Prior to starting a levy, you must know details about the assets. For bank accounts, you need to know which bank the debtor uses, and for wage garnishments, with who and where they are employed. To levy the debtor’s possessions, pay for a Writ from the court, then pay the Sheriff or a process server to notify the debtor’s bank or income source. If you do collect enough cash from the debtor to pay you what is owed, ensure to file a Fulfillment Of Judgment with the court to close your claim. To get your bank levy or other legal documents served fast, give JPL Process Service a call at (866) 754-0520. Rush jobs available upon request.